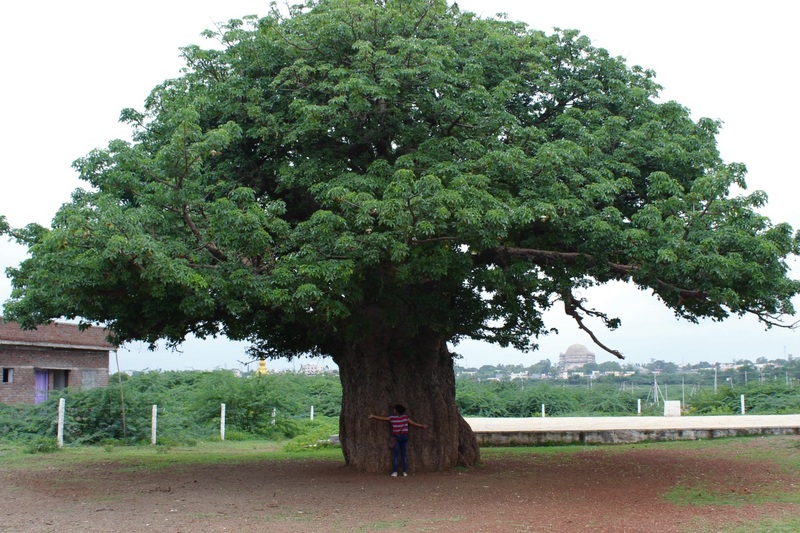 Ever since I saw the first Baobab at Savanur, I've been researching Baobab trees across India and found some 27 in all. Of those 27, two are at Bijapur - one tree is located next to Hazart Hander Shah Ali Hussain Dargah near Ibrahim Roza and another tree at a mosque in Yogapur locality. July 2; we were on our way from Hyderabad to Dharwad, we'd planned to touch few historical spots en route.. Bijjanahalli, Sedam, Chittapur and Ferozabad. We arrived at Bijapur around 8-45 PM. We started our tour of Bijapur by 8-AM. First was Ibrahim Rouza. 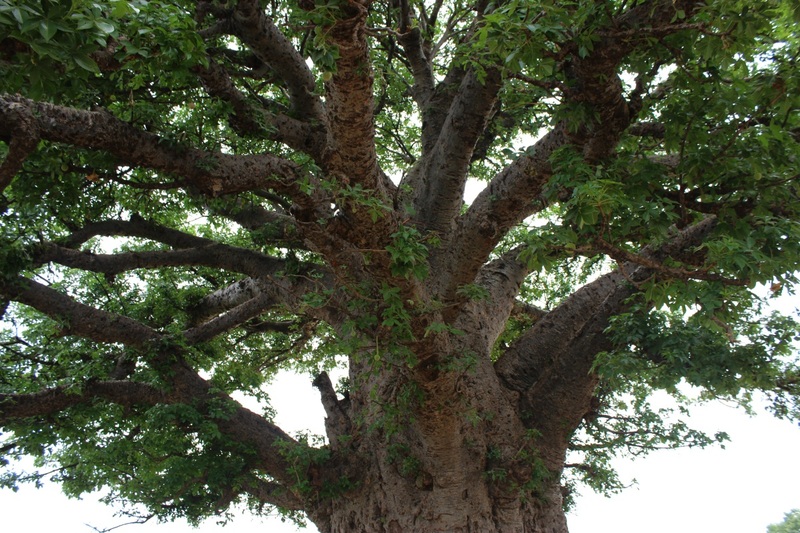 We inquired about the Baobab tree. Not many people were aware of the ancient tree. But then the ticket collector said the tree dried up and collapsed few months ago and nothing was left of it now. The tree was located near a well and we could see the spot. The approach road was dug up hence the spot was not reachable easily. I trusted the TC's words and dropped the idea of visiting the spot. A caretaker suggested us to visit Yogapur instead. We reached Yogapur by noon, locating the Dargah wasn't a problem. Happy to be looking at the tree. Compared to trees of Savanur and Golconda, this tree was slightly smaller but had a lovely shape.. like a mushroom. 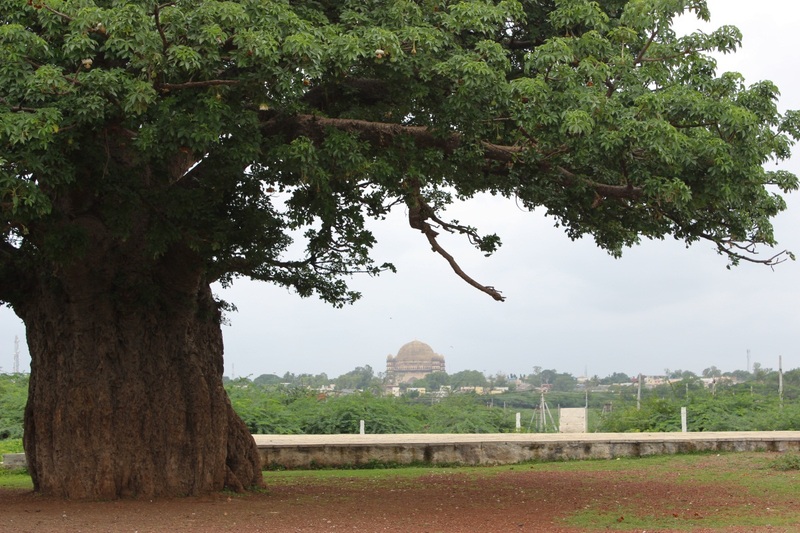 Pushpa standing next to the tree trunk..
Gol Gumbaz sitting on the horizon. Branches spread out equally in all directions. The dark green lobed leaves seems to be pretty young. Probably 2 months old. There were buds and flowers too.. off-white colored. 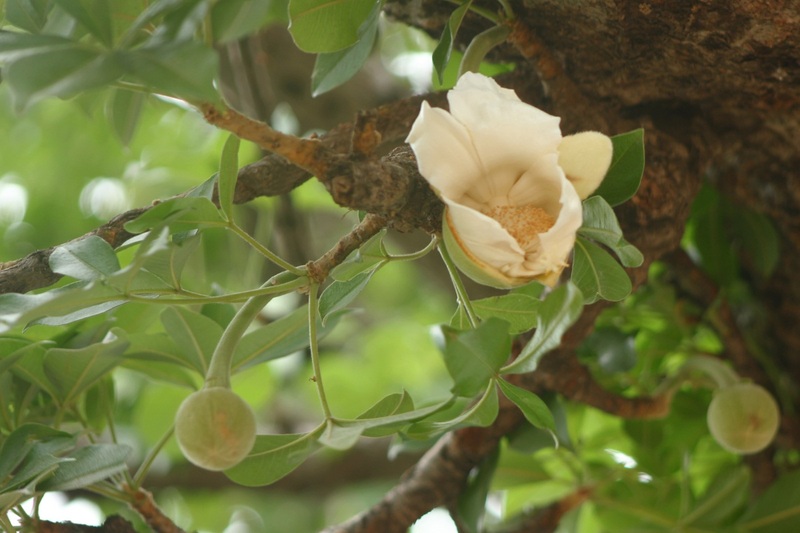 Buds are ball-shaped and the cup-shaped flowers have thick petals. 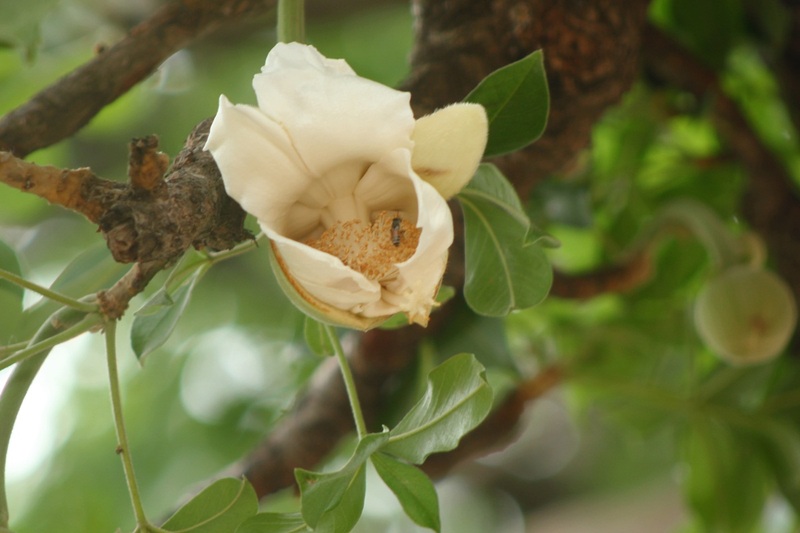 A closer look at a flower being pollinated by a bee. As we admired the tree, few local people appeared on the scene. Of them one was middle-aged. 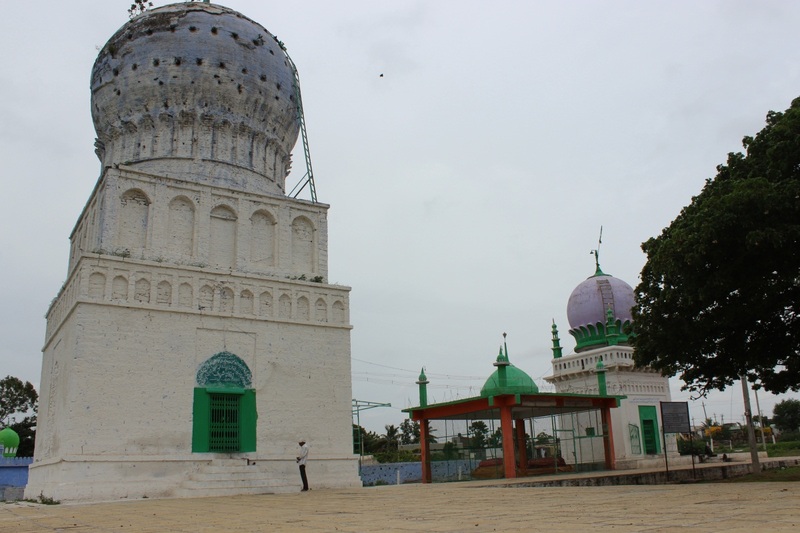 Sayed was one of the care-takers of the Dargah. 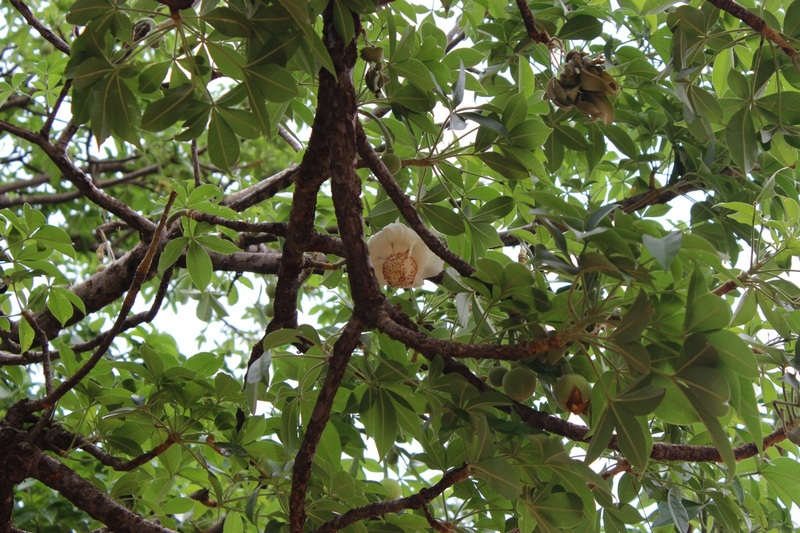 He had good knowledge about this tree's medicinal properties.. its leaves and fruits are used to cure health problems. In fact he suggested us to try chewing a leaf which we did. The leaves had a mildly sweet taste. I mentioned to them about the Baobab at Savanur. In fact Pushpa showed them the video of Savanur trees. 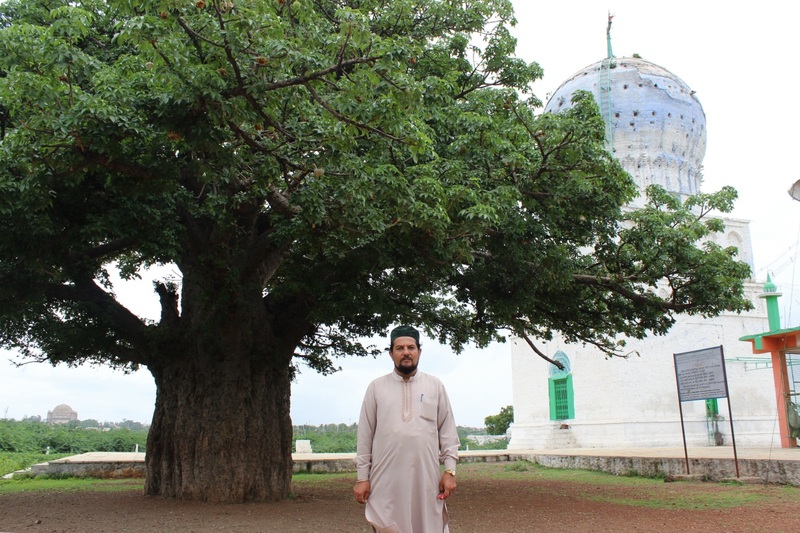 Sayed was friendly and spoke about how Sufi saints brought Baobab saplings from Africa and planted them in India. 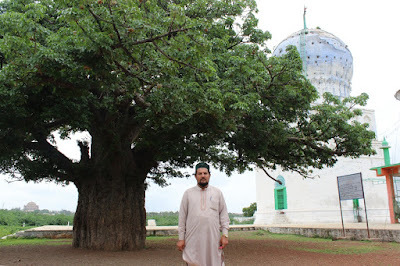 In fact these trees are found where Muslim kings ruled. 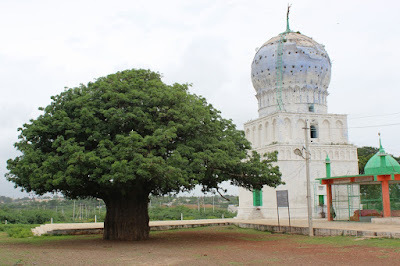 This lovely Gumbaz is the tomb of three Sayed Shah Imamuddin Quadri, Hazrath Sayed Shah Abdul Gafoor Quadri Shaheed Peeran and Sayeda Bibi Amatal Haleem. Here's a short video of the tomb and its green companion. Thank you - Anita and Trinity.